Posted By:Unknown | At:5:39 AM Be the first to comment! 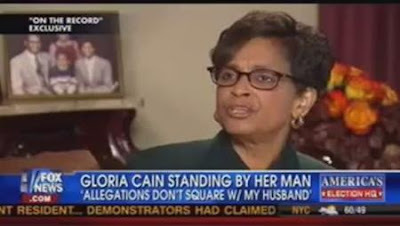 Gloria Cain, the wife of embattled Presidential hopeful Herman Cain, sat down with Fox News Greta Van Susteren for a rather candid interview. During the interview, they talked about everything from the sexual harassment allegations to how she and Uncle Herman met. After the interview, I can definitely see why Mrs. Cain has shied away from the television cameras. She definitely came across uncomfortable in front of it. I really felt sorry for her because no one should be forced into such a position, but she honestly had no choice since she was the only person who perhaps could have stopped the hemorrhaging her husband's campaign was experiencing. From the beginning of the interview, it was obvious that Uncle Herman is the talker in the family (something that even Gloria acknowleged when she said that he 'talks too much'.) She came across is rather shy and kinda delicate. I felt myself at times just wanting to give her a hug because she reminds you so much of someone in your own family. When asked about the sexual harassment allegations Mrs. Cain said her husband would have to have a 'split personality' to do the things he is being accused of doing. She went on to say that he was 'too old schooled' and had the utmost respect for women. She did admit that she paid attention to the allegations and as they grew she began to question things, "In the beginning I started thinking, 'could I have missed something?'" she said as the accusations grew, but she reasoned that "if I haven't seen parts of that person in 43 years, I don't think I'm that simple that I would miss something that significant." Mrs. Cain response to whether or not her husband would be a good President was also very interesting. "I think he would," she said with mild enthusiasm in her voice. "I think he would try to make a difference." Maybe it has something to do with the fact that she's a registered Democrat as to why the prospect of her husband becoming President doesn't have her jumping over the moon. Greta also talked met the rest of the Cain family which included his daughter and son.